The Room Passcode code for Zoom Rooms is a required 1-16 digit numeric lock code that is used to prevent users from making setting changes on the Zoom Room Controller or closing the Zoom Room application on the computer. As an admin or owner with access to Zoom Rooms, login to the Zoom Rooms page of the Zoom web portal. 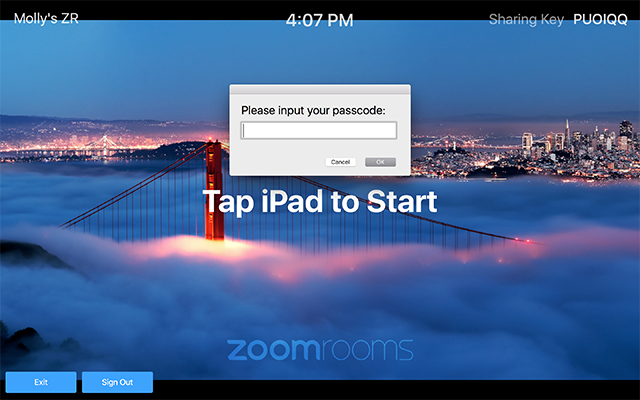 Locate the Zoom Room you need to view or edit the Room Passcode for. C lick Edit on the right side. Scroll down to the Room Passcode under Room Profile. You will have to enter the room passcode on the controller when you would like to change settings or to sign out/exit the Zoom Rooms application on your Zoom Rooms controller or computer.